Used for dislocated shoulder, frozen shoulder, broken collar bone, Rotator Cuff and Acromio-Clavicular injuries. Provides support, therapeutic heat and shoulder pain relief. Fastens securely around the right shoulder with the Velcro straps to provide support and re-assurance following a dislocated shoulder or injuries to the Acromio-Clavicular joint (shoulder separation). The warmth provided by the neoprene support can be very therapeutic for those people who have Frozen Shoulder, shoulder bursitis or 'Impingement Syndrome'. 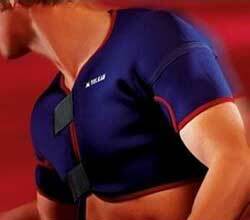 The compression and warmth can also provide pain relief following shoulder surgery; or following a broken Collar bone. Features Vulkan's patented spiral lining to remove excess perspiration. Many elite athletes such as football goalkeepers, baseball pitchers and rugby players use this product to give some re-assurance to previously injured shoulders. Anytime for therapeutic heat and shoulder pain relief. Fastens securely around both shoulders with the Velcro straps to provide support and re-assurance following a dislocated shoulder or injuries to the Acromio-Clavicular joint (shoulder separation). The warmth provided by the neoprene support can be very therapeutic for those people who have frozen shoulder, shoulder bursitis or 'Impingement Syndrome'. 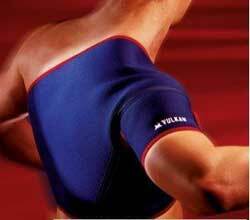 The compression and warmth can also provide pain relief following shoulder surgery or following a broken Collar bone. Features Vulkan's patented spiral lining to remove excess perspiration. Many elite athletes such as football goalkeepers, baseball pitchers and rugby players and gymnasts use this product to give some re-assurance to previously injured shoulders.